283 Commonwealth is located on the north side of Commonwealth, between Gloucester and Hereford, with 20 Gloucester to the east and 285 Commonwealth to the west. 283 Commonwealth was built in 1879-1880 by Weston & Shepard, masons, and Creesy & Noyes, carpenters, for real estate dealer Henry Whitwell, for speculative sale. He is shown as the owner on the original building permit application, dated October 29, 1879, and on the final building inspection report, dated August 5, 1880. No architect is identified on the permit and inspection documents. The house was built on a portion of a 190 foot parcel running west from the northwest corner of Commonwealth and Gloucester that Henry Whitwell had purchased on April 1, 1872, from a real estate investment trust formed by Grenville Temple Winthrop Braman, Henry Dwight Hyde, and Frank William Andrews. The parcel was part of one of four tracts of land purchased by the trust on March 1, 1872, from the Boston Water Power Company. Click here for an index to the deeds for 283 Commonwealth. On February 15, 1881, 283 Commonwealth was purchased from Henry Whitwell by Mary Wallingford (Herrick) Dame, the wife of liquor dealer Frank O. Dame. They previously had lived at 142 West Chester Park. Frank Dame died in February of 1886. Mary Dame moved to the Hotel Vendome for the 1886-1887 winter season, and then to 333 Beacon. She continued to own 283 Commonwealth and lease it to others. By the 1886-1887 winter season, 283 Commonwealth was the home of brick manufacturer John Henry Hubbell and his wife, Sarah Marietta (Dana) Hubbell. They had lived at 250 Commonwealth during the previous season. 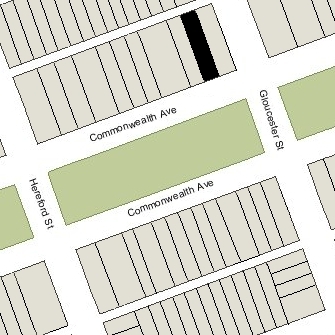 They continued to live at 283 Commonwealth in 1889, but had moved to 383 Commonwealth by 1890. During the 1889-1890 winter season, 283 Commonwealth was the home of Mary (Vinton) Clark, the widow of Randolph Marshall Clark, who had been treasurer of the Boston Elastic Fabric Company. She also maintained a home in Pomfret, Connecticut. She had lived at 148 Commonwealth during the 1886-1887 winter season. By the 1891-1892 season, she had moved to 27 Commonwealth. During the 1890-1891 winter season, Mary Dame was living at 283 Commonwealth once again. She moved soon thereafter to Brookline. On May 22, 1891, 283 Commonwealth was purchased from Mary Dame by Thomas Reed Wheelock. He and his wife, Edith Haswell (Clarke) Wheelock, made it their home. They previously had lived at 196 Commonwealth. Thomas Wheelock was a ship broker doing business in Shanghai. During the 1897-1898 winter season, the Wheelocks were living elsewhere and 283 Commonwealth was the home of Eliza Jones (Hersey) Andrew, the widow of John Albion Andrew, who had served as Governor of Massachusetts during the Civil War. She previously had lived at the Hotel Agassiz at 191 Commonwealth. She continued to live at 283 Commonwealth until her death in June of 1898. By the 1898-1899 winter season, the Wheelocks were once again living at 283 Commonwealth. They continued to live there in 1905, but during the 1905-1906 winter season, they were elsewhere and it was the home of Morris Gray and his wife, Flora (Grant) Gray. He was an attorney and trustee of estates. 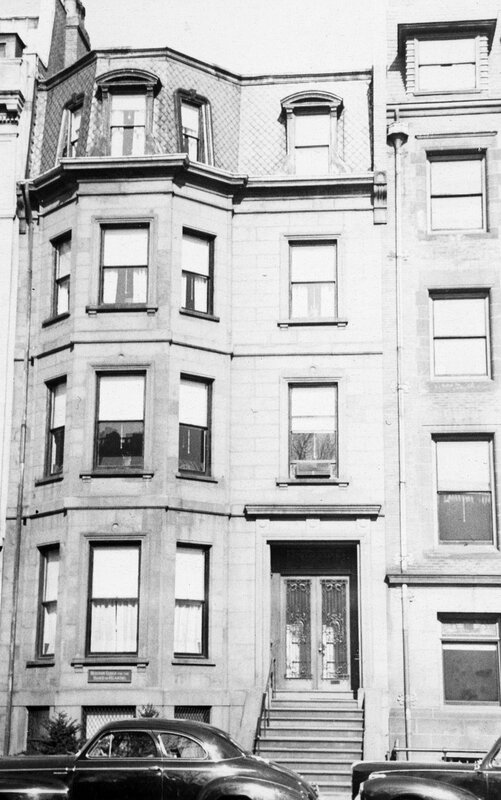 By the 1906-1907 season, they had moved to 149 Beacon, and 283 Commonwealth was the Wheelocks’ home once again. 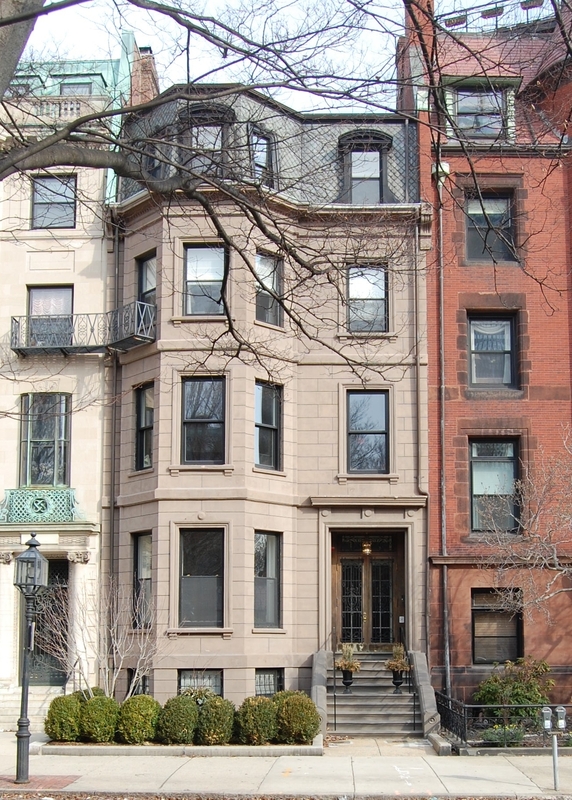 In the spring of 1910, at the time of the 1910 US Census, the Wheelocks were living elsewhere and 283 Commonwealth was the home of dry goods merchant Henry Coffin Everett and his wife, Ellen Crocker (Tufts) Everett. The had lived at the Hotel Somerset during the 1909-1910 winter season. By the 1910-1911 winter season, the Everetts had moved to 353 Commonwealth and the Wheelocks were once again living at 283 Commonwealth. During the 1912-1913 winter season, the Wheelocks were joined at 283 Commonwealth by Mrs. Clarise Sears (Risley) Ramsay, wife of William McCreery Ramsay. Edith Wheelock died in May of 1913. Thomas Wheelock continued to live at 283 Commonwealth. By the 1913-1914 winter season, he was joined there by Philip Leffingwell Spalding and his wife, Katherine Hobart (Ames) Spalding. They previously had lived at 265 Commonwealth. He was president of the New England Telephone & Telegraph Company. Thomas Wheelock continued to live at 283 Commonwealth during the 1914-1915 winter season, but moved thereafter, probably to Shanghai (where he died in January of 1920). The Spaldings continued to live at 283 Commonwealth during the 1917-1918 season, but moved thereafter to Cambridge. By the 1918-1919 winter season, 283 Commonwealth was the home of Jesse S. Koshland and his wife, Edith (Guggenheim) Koshland. They previously had lived at 479 Commonwealth. They also maintained a home in Manchester, Massachusetts. Jesse Koshland was a wholesale wool merchant from San Francisco. The Koshlands first leased the house from the Wheelock family and then purchased it on August 23, 1923, from Thomas Wheelock’s heirs: his daughter, Mary Florence (Wheelock) Ayscough, the wife of Francis Ayscough, and his daughter-in-law, Lois Hazen (Grimmer) Wheelock Dalgliesh, the widow of Geoffrey Manlius Wheelock and the wife of Robert McEwan Dalgliesh. The Koshlands continued to live at 283 Commonwealth until about 1931, when he closed his business and returned to California. The house was not listed in the 1932-1937 Blue Books and was shown as vacant in the 1931-1937 City Directories. On May 26, 1937, 283 Commonwealth was purchased from Jesse Koshland by the Boston Guild for the Hard of Hearing. It previously had been located at 339 Commonwealth. In July of 1937, the Guild filed for (and subsequently received) permission to convert 283 Commonwealth from a single-family dwelling into offices and a dwelling. The permit subsequently was abandoned, but the Guild nevertheless occupied the property as offices, meeting rooms, and a school for the hearing-impaired. On June 1, 1999, 283 Commonwealth was purchased from the Boston Guild for the Hard of Hearing by the Third Stone from the Sun LLC of Saugus (Daniel Silva, manager). That same month, it applied for (and subsequently received) permission to convert the property into four apartments. On August 23, 2000, it converted the property into four condominium units: The Guild House Condominium.